"Cabaret" by Kander and Ebbs, produced by the Paramount Theater in Aurora. Yes, we did it again – saw our favorite musical. It’s an hour drive west to Aurora, IL with little or no traffic. Therefore, Saturday or Sunday matinees are our only options. This was the Saturday matinee on St. Patrick’s Day, so a good plan to be away from Division Street bars and drunken amateurs. The Paramount Theater opened for movies in 1931. In addition to “talkies”, it also offered vaudeville, concerts, sing-a-longs and circus performances…all inside Illinois’ first air-conditioned building outside of Chicago. Acoustics and sight lines were so well designed there was not one bad seat in the house. The theater served the community for 40 years. Then, like many grand, old movie houses, it fell into disrepair. In 1976, restoration began, as part of the revitalization of Aurora, which had lost its cache as a good place to live on the Fox River. 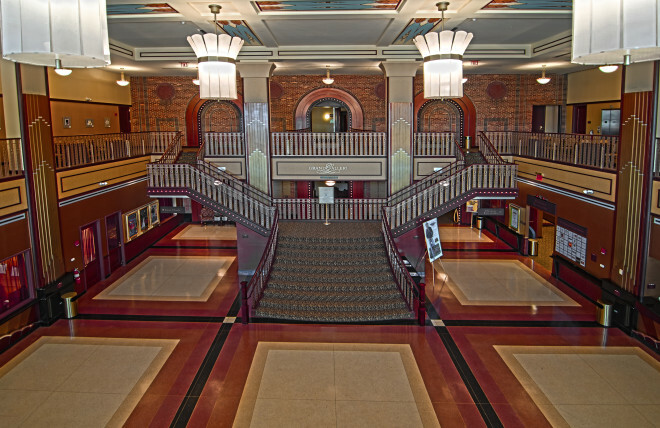 Today, it is a beautiful venue, and Aurora has grown to the second largest city in Illinois. Where city theaters are seeing their subscriptions decline, The Paramount had 36,000 subscribers to it 1888 seats. Well done, all! The secret to their success is producing Broadway caliber musicals way out in the suburbs. They tapped a financially secure market that does not want the trouble of getting to the city, surviving traffic, and searching for parking space. But they want good theater. We enjoyed Cabaret; not so much the trip to the suburbs and not so much our seats in the middle of the balcony. We are spoiled by our smaller venues in the city where you can see the performers, not just hear them.